The Laws are John and Michele Law, husband and wife singers, songwriters and first-class instrumentalists from Ontario, Canada. Natural chemistry between musicians is largely beyond manipulation: it either materializes and ignites or it doesn't. The Laws have chemistry to spare! 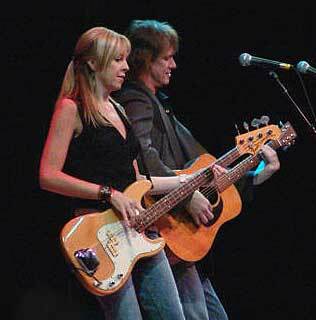 This dynamic couple exploded onto the Canadian music scene in 2000 with the release of their first independent CD. They received rave reviews across the country, 1/2 page spotlight articles in major national newspapers and sold-out shows across the country; not bad for their first tour! They were invited to play all of the prominent festivals in Canada and toured extensively through their home country, perfecting their live performance, before heading south. In fact, it was during this first cross Canada tour that they were spotted by an Australia booking agent who booked them on the spot! They've since completed 3 highly successful tours in that country, having most recently played main stage at National, Port Fairy and Fairbridge Folk Festivals and appearing on national television. The Laws first foray into the United States in 2003 took them to the South West Folk Alliance Conference in Austin, TX, where they were immediately booked by every presenter in attendance! In Texas they've gone from opening act to headline attraction in 2 short years and were invited to perform main stage at the prestigious Kerrville Folk Festival 2004 and 2005 performing on the closing night and introduced as " Texans by way of Canada". The Laws are instantly recognizable by their bluegrass-infused "tight-as-a-glove" harmony singing. John & Micheles songs cross the boundaries of country, folk, bluegrass and blues and are at home sharing the stage with everyone from Lonestar to Emmylou Harris to Randy Bachman.